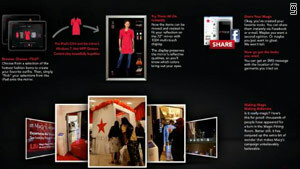 Macy’s shoppers can now check their look in a “magic mirror” in a fitting room, thanks to touchscreen computing. A large mirror, linked up to a touchscreen tablet computer, lets visitors to the iconic department store chain’s flagship New York location scroll through their options, then digitally “try on” clothes in the mirror. Then they can get quick feedback from friends by posting their image to Facebook or sending it in an e-mail or text. A camera attached to the mirror can send images, along with a computer-generated password, to the shopper’s friends. Note: The magic mirror is only the “T” in SGEye’s TRI/ID (Try-Restyle-Improve/Iterate until Delighted) Tool. SGEye will allow the user to restyle the item, and the restylings are used as additional inputs for the recommendation engine to generate better recommendations. This loop iterates until the customer is delighted with the final choice(s).